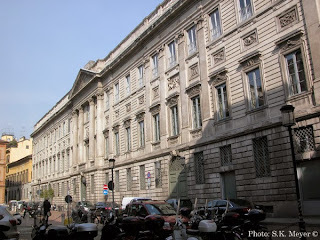 My Milan (Italy): 48 hours to visit Milan? Here are my suggestions for two food- and fun-packed days, especially for a first-time trip to the city. See my "48 hours for your first time in Milan" post for my "Art in Milan" column on the excellent "Where - Milan" web site. Congratulations on such a comprehensive article. It must have taken ages to complete the research. I've only skimmed but will keep going back to read again before we visit some of the streets we've not yet discovered. What a fantastic resource for visitors and 'locals'. Thank you! Very kind of you to write. It did take days and days and days, but it was a labor of love. When the holidays calm down in the New Year, I want to do at least one more for someone's second 48 hours in Milan because I had to leave out a lot of great stuff, not the least because it was too far away from the path that kept us huddled around the very heart of the center, so as not to waste time.